Small Blue Planet is a Bay Area based company focused on helping people and organizations create high quality and environmentally friendly, events, conferences and retreats. Recognizing the need for a more sustainable approach to doing business, Small Blue Planet (SBP) was founded in 2011 by Molli Milner. Her mission with SBP is to help build a sustainable future where the interests of the environment, people and business are mutually supported through relationship building, collaboration and real world solutions. Molli is a successful entrepreneur with a wealth of event management experience. Her warmth and inclusiveness make her a delight to work with. In 2011, Molli was the keynote speaker for greening events at the annual Plan Green Conference at UC Davis. She also planned and greened the biannual Geography of Hope Literary Conference, a project she has been involved with since it's inception in 2008. 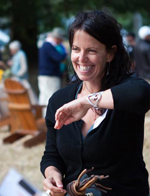 Molli has had extensive managerial experience in top Bay Area restaurants and has produced over 100 weddings, cultivating lasting relationships with photographers, musicians, wine makers, farmers…people from all aspects of managing farm-to-table restaurants and venues. Prior to SBP, Molli Milner was the co-founder of Green Girl Events, Green Girl Events received dynamic press from Sunset Magazine (Companies to Watch '09), California Home and Design, and Ideal Byte, to name a few. Within the Bay Area, GGE was hired by local and national non-profits including: Sierra Club, the Chez Panisse Foundation, and Marin Agricultural Land Trust (MALT).